Tim Tebow is way more than just an NFL player. Charity, religious affiliations, a symbol of virginity. He was a champions in College, winning two national titles with the Florida Gators. In the NFL? He’s probably at the lower half of the quarter back rankings. But that doesn’t seem to stop his myth from growing beyond the Football parks. A couple spent $100,000 dollars at the Tim Tebow Celebrity Golf Classic to get a chance to spend a day with Tebow. Not what you’re thinking. They’ll be spending it with unprivileged keys and Tebow near their home at the Florida Keys, part of the Tim Tebow foundation. But has ever a player been so inspiring to many off the field while actually doing a pretty bad job on the field? 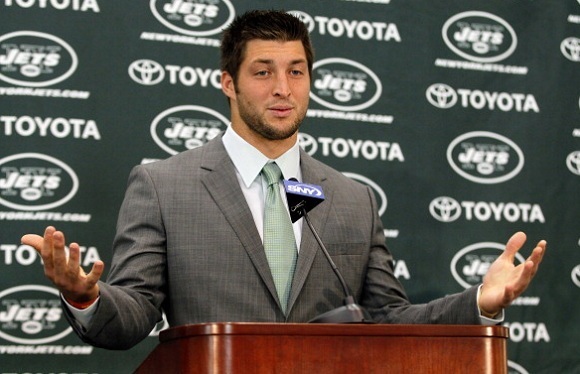 It’s hard to define Tebow in words as a player. He had a belief-defying run in the middle of the 2011 NFL season. He doesn’t throw the ball well, and can’t stay in the pocket. He never played well for three quarters during that impressive Broncos run. But he always picked it up in the fourth, creating comebacks through his legs, scrambling his way through to game winning drives. Until came a loss to the Patriots, and later another loss. People love or hate Tebow. Both for what he does on the field and what he represents to many off of it. The whole good-boy Christian persona might be, well probably is true, but it’s enough to gain enough opposition. Anything you do in this world regarding political views, and trust me, religion unfortunately has everything to do with politics, will get you an opposition. Problem is with Tebow, he doesn’t do enough on the field, or hasn’t done enough so far, to give many the notion he deserves this kind of attention off of it. Since his college days, Tebow has been a lightning bolt and a case study of how religion and sports, when the religion part is thrown strongly at your face while playing for a program like Florida. The Tebowing, the girlfriend he wasn’t… Everything in the national spotlight. The pressure at Denver wasn’t different, maybe even smaller because the crowd pushed him into the lineup instead of the always unpopular Kyle Orton. It was easy winning them over. In New York, it’s different. People embrace you and turn on you in two weeks. The expectations, the pressure, they’re like nowhere else. Even for the Jets, or maybe especially for the Jets, who missed the playoffs this season, taking a step backwards. The quarterback battle with Mark Sanchez might even get a Hard Knocks coverage. I’m not sure if it’ll do the team any good. But Tebow, despite his unimpressive numbers as an NFL quarterback and the general opinion that he won’t make it as a starter in the NFL – at some point becoming a perennial backup or simply slip out of the league after a few years, is here to stay. In the national spotlight, probably more influential as a person than as a player, making more of a difference off the field than on it.